At a Glance: World’s best-selling whey protein Higher pure protein percentage Fast-acting Hydrowhey peptides Provides whey protein microfractions Over 4 grams of glutamine and precursors Instantized to mix with a spoon Grams of BCAAs: 5.5 Milligrams of enzyme blend: 25 By using whey protein isolates as the primary protein source in Gold Standard 100% Whey, Optimum Nutrition is able to pack 24 grams of the purest muscle-building protein per serving, and a lot less of the fat, cholesterol, lactose, and other stuff that you can do without. There’s no question that this is the standard by which other whey proteins are measured. 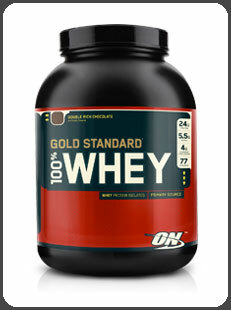 Optimum Nutrition Gold Standard 100% Whey, Double Rich Chocolate, 5 pounds.